The International Center is now providing a researched Compassionate Conflict Management course for a major metropolitan police department as the pilot training for this program. Get free, no obligation information on this track by using our convenient inquiry form. You're welcome to download and distribute the White Paper: The Impact of Police Compassion Competency. The Compassionate Police track is a training, coaching, and consulting program for police departments and international peacekeeping forces, with initial offerings in the United States. Developing a compassion competency is essential to effective law-enforcement. Incorporating compassion skills as a foundational element in police work can result in improved officer efficacy, lowered incidents of enforcement morbidity and mortality, more effective conflict management, decreased stress and the accompanying impact on disability claims and early retirements, enhanced sense of reward and satisfaction among police professionals, improved results in recruiting high-quality officer candidates, and dramatically improved public perception and support. This track is directed toward these concepts and the research associated with them. It also examines some of the challenges departments and international forces face in implementing a compassion competency program. Publications, including the forthcoming Compassionate Conflict Management: A Brief Guide for Law Enforcement Professionals. The International Center is now providing a researched Compassionate Conflict Management course for a major metropolitan police department as the pilot training for this program. More information on this program will be available soon. Research is being conducted by the International Center for Compassionate Organizations and the Department of Urban and Public Affairs at the University of Louisville. Following the introduction of the Compassionate Conflict Management training for police departments in the United States, the International Center will begin offering the program in Canada and — through our UK Center — in the United Kingdom. These offerings will be then made available worldwide. International military forces continue to be charged with the task of policing in areas challenged by conflict. Their objective is to support international agreements designed to alleviate (in some measure) hostility between governments and their peoples. Compassion and conflict management skills as well as the demonstration of compassion by international policing forces are essential to defuse misunderstanding, rage, hatred, racism, cultural differences, and violence. 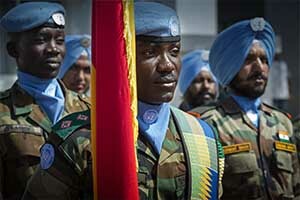 Initial work on the international peacekeeping program will take place in late 2016.